Who was that Purdue player who looked like Reggie Bush in Week 1? Is it too soon to start thinking about Jim Harbaugh's coaching future? Lane Kiffin's? What are the must-watch games for Week 2? Bleacher Report's Adam Kramer has the answers to those questions and more in his weekly college football notebook, the Thursday Tailgate. The first time I saw the most dangerous true freshman in college football's 2018 season, he was a high schooler working out in a dimly lit gym across the street from the Louisville airport. It was six months ago, and Rondale Moore was a senior at Trinity High School in St. Matthews, Kentucky. A 5'9", 175-pound wide receiver capable of squatting more than three times his body weight, he had committed to play at Purdue over Texas, Alabama, Ohio State and dozens of other traditional powers. Although I hadn't made the trip to see Moore—I was there to write a story about a 370-pound eighth-grader who was already receiving scholarship offers—he was impossible to miss. The way he seemed to hit full speed in a matter of steps. The way he would seemingly jump out of the gym to catch high throws. Even the most natural catches felt spectacular. His legend would grow over the months that followed, thanks to a video that went viral of him squatting 600 pounds. "I wasn't surprised, honestly," says Chris Vaughn, the owner of that gym in Louisville, Aspirations Fitness, who trained Moore throughout high school and says he regularly watched Moore squat 415 pounds 15 times. "I thought he could've done more. It looked a little too easy." But even he might have been surprised by what he saw last Thursday. In his first collegiate game, Moore broke Purdue's single-game all-purpose yards record—a mark that had stood for more than 40 years. And he nearly did so in his first half of college ball. Although he dropped the first pass thrown his way, Moore responded by scoring two touchdowns in the first quarter—a 32-yard touchdown grab and a 76-yard touchdown run, highlighted by a juke that would have made former USC great Reggie Bush proud. Even his marginal gains felt spectacular: a mix of speed and shake and high-stepping that made it feel like every touch could be a touchdown. Altogether, Moore finished his first game with 109 receiving yards, 79 rushing yards, 125 kick-return yards and two touchdowns. For those who watched Moore excel over the past few years, the performance, as spectacular as it was, felt like a matter of time. But even they struggled to convey Moore's potential to college coaches for years because of his size. Although he is listed at 5'9", it feels generous. And because of that, college coaches didn't flock to recruit the wideout during his high school career. "I tried to tell a couple different people I know," says Trinity offensive coordinator Andrew Coverdale. "I have never seen anything like his ability to change directions when he hits the top speed quickly. "I tried to tell them they needed to get in on it now, and by and large they didn't listen to me." Moore began his high school career at New Albany High in Indiana before transferring to powerhouse Trinity prior to his junior year. Transfer rules deemed Moore ineligible for much of his junior season, but when he returned to the field for the team's final four games, he made up for lost time, catching 20 passes for 464 yards and nine touchdowns. His arrival helped Trinity win the Class 6-A state title. And even then there were doubts about a player 247Sports' composite listed as the nation's No. 41 wide receiver in the class of 2018. 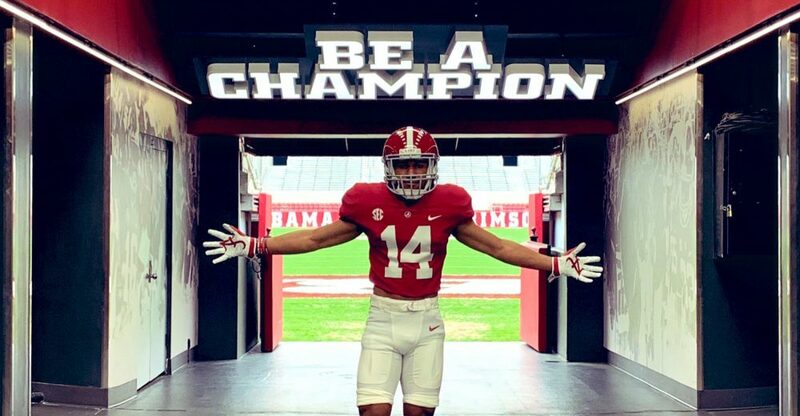 It wasn't until Moore clocked a blazing 4.33 in the 40-yard dash and posted a 42-inch vertical at The Opening, Nike's mega-recruiting summit, that the coaches stampeded to Trinity. After committing and then decommitting from Texas, Moore pledged his commitment to Purdue on national television in January during the U.S. Army All-American Bowl. The fact that one of the most coveted playmakers in the country picked a program that had won 16 of its previous 61 games sent a shock wave through the recruiting world. But Purdue head coach Jeff Brohm, a former Trinity grad, began recruiting Moore long before many others did. Couple that with a seven-win season, Brohm's knack for creative play-calling and the vicinity to Moore's hometown, and the receiver was sold. "This guy has some playmaking ability," Brohm says of Moore. "It's definitely seen by us and all of his teammates." Six months after I stumbled upon the undersized Trinity wideout, and a star is born. Although Moore has played exactly 60 minutes of college football, he left a first impression like few others that have ever played the sport. And because he's capable of playing so many different roles—roles that Purdue needs to fill—defensive coordinators have been put on notice. "I mean, there's nothing he can't do," Coverdale says. "It's really remarkable. I don't even know how to describe how liberating it is. He's really only limited by your imagination." Next up? Eastern Michigan on Saturday, which will undoubtedly have a game plan in place to slow him down. What's next for Jim Harbaugh? Through his first 40 games at Michigan, Harbaugh (28-12) has one more win than Brady Hoke (27-13) had as head coach of the Wolverines. On Saturday, it will have been one year since a Michigan wide receiver caught a touchdown pass. Harbaugh makes more money than almost any of his peers, and he has yet to win a conference title or deliver a truly memorable victory. So there are reasons to be concerned at the start of his fourth year. Expectations are not being met. But the idea that Harbaugh is even remotely close to the "hot seat" is misguided. There is a perception and mentality that is growing tiresome with head coaching tenures: You're either getting fired or you're not. There is no go-between. In the instance of Harbaugh, however, it's reasonable to find some sort of middle ground, at least for the time being. The program is in far better shape than it was under Hoke. There is talent in place, and it feels like winning is simply a matter of time. Whether this comes at a Nick Saban or Urban Meyer level—a ridiculous bar that Harbaugh is expected to clear, which is perhaps part of the problem—is still to be decided. But it seems appropriate to let things play out a while longer, though, yes, that's getting tougher to say as the games go by. Regardless, Harbaugh isn't going anywhere unless he does on his own accord. Bear with me for a moment, if you will. Kansas lost to Nicholls State this past weekend—the latest, lowest point for the Jayhawks. Florida Atlantic, meanwhile, after winning 10 games in a row to end last year, lost to Oklahoma by roughly 17,456 points. So why not bring in someone who can A) score touchdowns B) recruit and C) generate buzz simply by being himself (and tweeting). Will it happen? Almost certainly not. Call it wishful thinking. Kiffin will likely be able to do better than Kansas, assuming the next few months finish as they should. But after all that Kansas football fans have endured the past decade, they deserve something to hope for. If this coming weekend's games were a food item, it would not be a dry-aged bone-in ribeye. More like a nice seared chicken breast with quality sides. The potential is there, but the chef has to deliver. No. 17 USC at No. 10 Stanford (Saturday, 8:30 p.m.): Someone forgot to change Bryce Love's batteries—that can be the only explanation for why the human cheat code ran for 29 yards on 18 carries in Week 1. That will change, although JT Daniels, USC's true frosh QB who should still be in high school, could arrive in a hurry. No. 2 Clemson at Texas A&M (Saturday, 7 p.m.): The atmosphere in College Station is going to be delightful. This much we know. We also know that Texas A&M just gave head coach Jimbo Fisher $75 million to win games like these, albeit not this early in his tenure. Even a close game would be a big deal in Aggieland. No. 3 Georgia at No. 24 South Carolina (Saturday, 3:30 p.m.): At this moment in time, South Carolina feels severely underrated. That could change this weekend against a popular playoff pick. At the very least, give this one—and South Carolina's touchdown machine receiver, Deebo Samuel—your full attention, just in case it does. No. 15 Michigan State at Arizona State (Saturday, 10:45 p.m.): Just look at that glorious start time. What are you going to do, sleep? Don't think so. You're going to watch Herm Edwards attempt to rip off a huge out-of-conference win at home. Given the teams and game time, something weird seems destined to happen. BONUS GAME: Arizona at Houston (Saturday, Noon): The season didn't start how it was supposed to for Arizona quarterback Khalil Tate. But watching all-everything defensive tackle Ed Oliver, who had 13 tackles last week, chase around the most exciting quarterback in the sport is too good to pass up. Celebrating turnovers in creative ways is the latest fad in college football, whether it's a belt or the much-discussed turnover chain in Miami. More and more teams are catching on. But Boise State now has a stranglehold on the genre. Behold the turnover throne. Interested? The Broncos are a massive favorite against Connecticut this week, so you shouldn't have to wait long to see it. Bless you, Mike Leach, for bringing something that would be banned from most turkey bowls to an actual football game. Against Wyoming in Week 1, Leach uncorked a bizarre formation that included an offset offensive line and a diagonal snap from a wide receiver. Leach says he calls this "Big Gulp Left" and that he came up with the idea while working with an engineer from Microsoft. Of course he did. Washington State kicks off at 11 p.m. Eastern this weekend against San Jose State, as if you needed any other motivation to tune in. Not the start I was hoping for, obviously, but college football picks against the spread have no memories. I would tell you that these are for entertainment purposes only, but that doesn't sound like much fun. We'll use the Westgate odds, courtesy of OddsShark, and hope we use them well. South Carolina (+10) vs. Georgia: This feels like a game that Georgia will win, but I don't believe it will come easy. South Carolina almost pulls this one off (and covers). Fresno State (+2) @ Minnesota: A fascinating line for a team that just dropped 79 points in its opener. Fresno State is a live road dog here, without question. Miami (OH) (-1) vs. Cincinnati: This is one of my favorite spreads of the week and the ultimate letdown situation after Cincinnati beat UCLA in Week 1. Arizona State (+6) vs. Michigan State: For as much as we all criticized the hire of Herm Edwards, ASU sure looked functional in Week 1. Sparky covers (and wins outright). Pittsburgh (+8.5) vs. Penn State: An intriguing spot for Penn State after nearly losing in Week 1. The Nittany Lions will win, but it will have to be in thrilling fashion once again.